DesertRat created T127372: Persistance on Experimental. DesertRat created T126910: Invisible downed tree. DesertRat created T126698: VS3 Lag and rubber banding .62 Experimental. DesertRat added a comment to T126405: V3S Truck Glov Plug / Deathtrap issue. I have not known the V3S to use a glow plug in quite some time. If the truck won't start, and the battery is good, chances are that the truck has been crashed. DesertRat created T126434: Invisible tree. DesertRat added a comment to T125044: Green / Yellow Sky in game and lobby. Have not seen in current builds. DesertRat created T126126: Yellow Smoke. DesertRat created T126038: Invisible Rocks .62 stable. DesertRat created T125810: Graphic bugs. DesertRat added a comment to T125334: Crash upon exit .62 Exp. DesertRat added a comment to T125177: Truck Tipping Terrain .62 Experimental. DesertRat created T125414: VS3 Lag and rubber banding .62 Experimental. I think that is the correct date. Not sure what files you want, there are lots of them, these are from around that date. I also got server full message again, (upload failure). DesertRat created T125359: Game crash .62 Exp. DesertRat created T125335: Error in Lake texture .62 Exp. DesertRat created T125334: Crash upon exit .62 Exp. DesertRat created T125278: Truck not moving in .62 experimental. DesertRat added a comment to T125137: Lag in .62. Choppy lag usually there around structures and/or infected. It will persist until I move to open area. DesertRat created T125210: Sighting in .62 Experimental. DesertRat added a comment to T125178: VS3 Lag and rubber banding .62 Experimental. The lag and rubber banding is constant for the driver, but not for the passenger, who may have a smooth ride or large de-sync between vehicle and himself. We are using servers under 100 ping and have played over 200 ping servers. DesertRat created T125178: VS3 Lag and rubber banding .62 Experimental. DesertRat created T125177: Truck Tipping Terrain .62 Experimental. DesertRat created T125176: Miscolored sky .62 experimental. DesertRat created T125138: Surf sound going too far inland .62 Experimental. DesertRat created T125137: Lag in .62. DesertRat added a comment to T124415: Spinning Truck Trap. Hi, still having trouble with trucks. The one tonight would not steer after using it 10 minutes. My FPS was 125 but truck was driving all over the place, I could only control speed to a certain point - the only way I could get truck to stop jiggling was to get out. At one time, the truck held me prisoner, it wouldn't let me walk away. 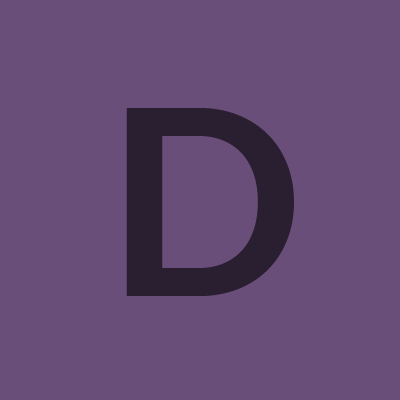 DesertRat added a comment to T124459: Lag, lag, lag. The above was filmed on a full server. The car videos I have weren't, but the motion is the same. We end up crashing into trees, fences, rocks, etc. DesertRat created T124459: Lag, lag, lag. I had view of spinning both in third and first person views. My last views after the truck disappeared in the ground was at ground level. I have managed to extract the spinning visible when my friend drove up, but I am still getting an upload failure message. DesertRat created T124415: Spinning Truck Trap. DesertRat added a comment to T123739: Crash - whole player dupe bug. My friend's video of the incident. Well, it happened again, about the same place but on the taxiway on north side of runway. This time, when I respawned and my screen went black, I did not find my self near the car, I was at the last place I got out of the car. Sorry for long wait for reply, as far as we know, there was no server crash at any time. Usually Dayz Spy marks a server restart on the timeline. We were able to immediately go back in after the second crash w/no error message. DesertRat added a comment to T109098: Player keeps running and spinning by himself. Have this happen when intersecting some roads. Video of the spin attached, my friend had the same thing happen and he has a much better computer than I do. DesertRat added a comment to T123731: State of vehicles on stable. Multiple bug reports. 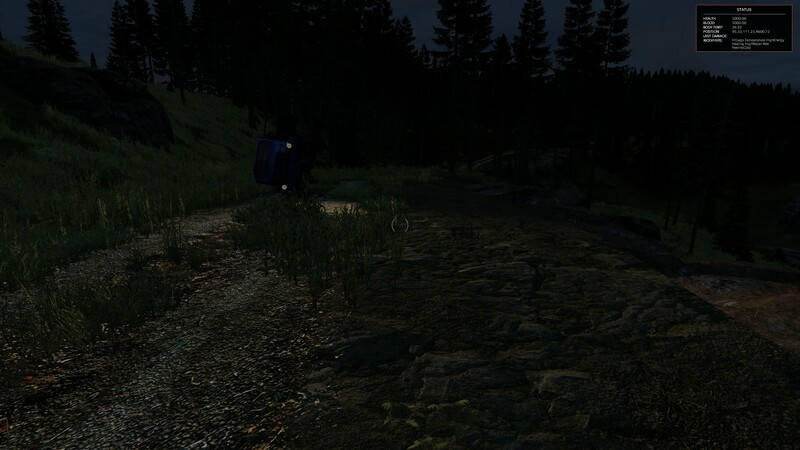 ZOMBIE AI, PERFORMANCE DROPS, VEHICLE PARTS AND BEHAVIOUR. .
Our vehicles have been where we left them the next night. What concerns me is that numerous wrecked vehicles are not fully "ruined" and thus are not usable. My friend and I have been working on a truck stuck in the Devil's castle first gate, (not the one with the humped driveway). It has been grenades, shot, pushed by another truck, etc. Its still there but is unusable. DesertRat created T123739: Crash - whole player dupe bug. DesertRat created T123692: Sliding around a corner. DesertRat added a comment to T123526: Vehicle progress so far. Hi, as my FPS gets worse the longer I play, you are looking at the video I took before logging off. Actually, it started when my FPS was twice what it was at the end, (I know, 2 X 8 is only 16 FPS). In looking at the video, the sound matches the desync I am experiencing, so it could be that. This is the same sound problem, but in the sedan. DesertRat created T123526: Vehicle progress so far. DesertRat created T123494: Inventory management. DesertRat added a comment to T115748: Loot spawning/central economy seems to spawn a handful of items everywhere. DesertRat created T123039: Wolf remains remain for a long time... .61 stable. DesertRat created T122980: Invisible Infected .61 stable. DesertRat created T122560: Vehicle Report #4 Truck .61 64b exp. DesertRat created T122535: Vehicle report #3 Truck .61 exp 64b. DesertRat created T122518: Vehicle report #2 Truck in .61 exp. DesertRat added a comment to T122444: [Exp] 0.61.136887 loot distribution bug/ stable version. I could be wrong, looks like normal civilian weapon spawning. Some might be there because others before you have taken other weapons? DesertRat updated the task description for T122501: Vehicle report .61exp. DesertRat created T122501: Vehicle report .61exp. DesertRat added a comment to T122404: 0.61 stable - Grafic when carrying Wolf Pelt bugged. Ahh, the old stretched arm bug. On an earlier build, the mines did the same thing. 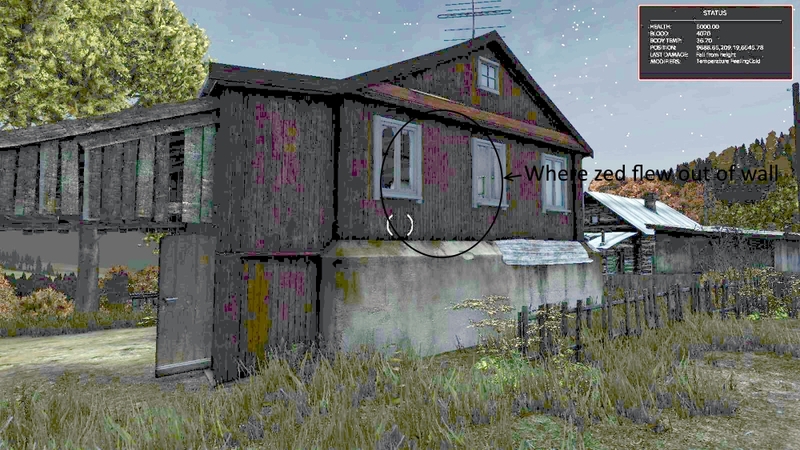 DesertRat added a comment to T122409: 0.61 Stable - Red House Glitches (Several) . Was just going to turn this one in. I could get through the door on experimental, but door is still opening weird. DesertRat created T122279: Agressive "Infected" passing through doors, walls, and now floors .61. DesertRat added a comment to T122099: Agressive "Infected" passing through doors, walls, and now floors .61. DesertRat added a comment to T122093: Random performance drop of ~50%. My FPS drops to 1 and the game is completely locked up, nothing I do will fix it other than exiting game, (if I can get menus to work) or by closing and restarting game in the task manager. DesertRat created T122100: Miscolored leaf piles. DesertRat created T122099: Agressive "Infected" passing through doors, walls, and now floors .61. DesertRat added a comment to T121636: Game won't launch after last exp 0.61 patch. DesertRat edited Steps To Reproduce on T122051: Game Crash .61 64bit. DesertRat added a comment to T122051: Game Crash .61 64bit. DesertRat created T122051: Game Crash .61 64bit. DesertRat created T121861: Infected trapping players and/or pushing them out of buildings. I have to allow both the Steam web pages through my Virus checker/firewall and the ones from Dayz, otherwise nothing updates. DesertRat created T121620: Minor Loot explosions .61. DesertRat created T121601: Floating Hay bales .61. DesertRat created T121600: Warped arm carrying wolf pelt. DesertRat created T121599: Sound bug .61. DesertRat added a comment to T121584: Loot not spawning in 3 types of houses [0.61 exp]. Agreed, no loot spawning in these houses. DesertRat added a comment to T121539: Tower ladder placement. This is a duplicate, I found it reported much earlier. DesertRat created T121539: Tower ladder placement. DesertRat created T121538: Apple trees reflection on branches .61 latest build. DesertRat created T121537: Game crash on exit. DesertRat created T121456: Character stuttering on slow run .61. DesertRat added a comment to T121451: 0.61 Items thrown with G sink through the ground and disappear. Same here, backpacks, guns, barrels, etc. DesertRat created T121454: Door too small. DesertRat created T121280: Infected slow exp. DesertRat renamed T121278: Door opening exp from Door opening to Door opening exp. DesertRat created T121279: Fence through house. DesertRat created T121278: Door opening exp. DesertRat created T121244: Desync around cows, etc..
DesertRat created T121243: Flares staying on person even if thrown..
DesertRat created T121242: Doorways not enterable. DesertRat created T121230: Floating infected. DesertRat added a comment to T121062: Stuck under house. The buildings, (red and green), with the outside staircase(s) are glitched. Don't log out in them. You can Google to see several ways that people have used to get out or wait for help from here. DesertRat created T120962: Sporter noise. DesertRat created T120961: Graphics cleanup needed. DesertRat added a comment to T120663: FPS Forest/open vs Cities. Deleted contents of folder, fps was worse, would have to go and reset it to what I have to improve. DesertRat added a comment to T119657: Hotfix disabled Steam overlay. Was fixed, graphics driver problem, works now. DesertRat created T120663: FPS Forest/open vs Cities. DesertRat removed a watcher for DayZ: DesertRat. DesertRat changed Category from category:general to category:sound on T119656: Sound bug while being a passenger in 4X4. DesertRat changed Category from category:general to category:visualvehicles on T119655: Double vehicle spawns.